Cul1 is a core component of the evolutionarily conserved SCF-type ubiquitin ligases that target specific proteins for destruction. SCF action contributes to cell cycle progression but few of the key targets of its action have been identified. We found that expression of the mouse Cul1 (mCul1) in the larval wing disc has a dominant negative effect. It reduces, but does not eliminate, the function of SCF complexes, promotes accumulation of Cubitus interruptus (a target of SCF action), triggers apoptosis, and causes a small wing phenotype. A screen for mutations that dominantly modify this phenotype showed effective suppression upon reduction of E2F function, suggesting that compromised downregulation of E2F contributes to the phenotype. Partial inactivation of Cul1 delayed the abrupt loss of E2F immunofluorescence beyond its normal point of downregulation at the onset of S phase. Additional screens showed that mild reduction in function of the F-box encoding gene slimb enhanced the mCul1 overexpression phenotype. Cell cycle modulation of E2F levels is virtually absent in slimb mutant cells in which slimb function is severely reduced. This implicates Slimb, a known targeting subunit of SCF, in E2F downregulation. In addition, Slimb and E2F interacted in vitro in a phosphorylation-dependent manner. We have used genetic and physical interactions to identify the G1/S transcription factor E2F as an SCFSlmb target in Drosophila. These results argue that the SCFSlmb ubiquitin ligase directs E2F destruction in S phase. The ubiquitin-proteasome pathway is essential for degradation of many regulatory proteins. Proteins are targeted for proteasome-mediated degradation by attachment of a polyubiquitin chain. The addition of a polyubiquitin chain to a protein requires the sequential action of a ubiquitin-activating enzyme (E1), a ubiquitin-conjugating enzyme (E2) and a ubiquitin-protein ligase (E3) . E3 activities are thought to be essential because they are involved in substrate recognition. SCF complexes are E3s composed of the Cullin family member Cul1 (Cdc53 in S. cerevisiae), as well as, Skp1, Roc1 (also called Rbx1 or Hrt1) and one of the numerous F-box proteins that act as a receptor for the substrate (for review see ). The founding member of the SCF family, SCFCdc4, was identified through genetic analysis of the G1/S transition in budding yeast and served as a model for the study of other SCF complexes. Mutations in the E2 enzyme Cdc34 or in any of the SCFCdc4 components (Cdc53/Cul1, Skp1 and Cdc4) arrest cells at the G1/S transition because of a failure to degrade the cyclin-dependent kinase (CDK) inhibitor Sic1 . In a wild-type situation, G1 cyclin/CDK complexes phosphorylate Sic1 at the end of G1. This leads to Cdc34-dependent ubiquitination and degradation of Sic1. Phosphorylated Sic1, but not the unmodified protein, is recruited to the SCF complex by binding to the WD domain of Cdc4 . The F-box motif of Cdc4 binds Skp1 so that the F-box protein acts as a bridge between substrate and the SCF complex. Cdc53 forms the core of the complex by binding Skp1, Roc1 and Cdc34. The Cdc53/Roc1 subcomplex stimulates the ubiquitination activity of Cdc34 . Upon association with the complex, Sic1 is extensively ubiquitinated and then degraded by the proteasome. While mutations in the CDC53 gene of S. cerevisiae eliminate SCF activity toward its many diverse targets, the phenotype is nonetheless specific. Presumably, arrest at the G1/S transition is a result of the thresholds and kinetics of action of the various substrates, which imparts special importance to the targeting of Sic1 for degradation. Mutations in the C. elegans ortholog Cul1 lead to increased cell number  showing that in this organism a different aspect of cell cycle regulation is controlled in a Cul1 dependent fashion. It has been inferred that a deficit in Cul1 function results in defects in turn-over of specific proteins and that the phenotype varies between systems because of differences in the spectrum of proteins affected and differences in the importance of the targeted proteins. The transcription factor E2F is an important regulator of the G1/S phase transition in metazoans and a major target of the tumor suppressor Rb . The mechanisms controlling E2F activity have not been completely elucidated. E2F is activated toward the end of G1 and it functions to promote S phase. Nonetheless, E2F is inactivated and/or downregulated upon progression to S phase, a regulatory feature that appears critical as E2F overexpression or ectopic activation induces apoptosis both in mammalian cells and in flies . Inactivation of the DNA-binding activity of E2F-1 by the cyclin A/Cdk complex has been shown to be critical for proper S phase progression . In mammalian cells, E2F-1 is also subject to proteasome-mediated degradation  and recent evidence indicates that E2F-1 degradation occurs in S phase . Control of E2F-1 stability has also been linked to its association with the F-box protein Skp2  but this has not been tied to a specific phase of the cell cycle. In addition, Skp2 knock-out cells do not accumulate E2F  and an E2F mutant unable to bind Skp2 is still ubiquitinated and unstable . Thus, the basis of S phase destruction of E2F-1 remains unresolved. Analysis of E2F levels in the Drosophila eye disc showed a disappearance of E2F staining in the S phase cells of the morphogenetic furrow, suggesting conservation of the S phase destruction of this regulator . To explore potential roles for Cul1 in cell cycle control in D. melanogaster, we overexpressed mouse Cul1 (mCul1) in the wing imaginal disc and found that this overexpression has a dominant negative effect leading to a reduction in SCF function. A screen for modifiers of the resulting small wing phenotype identified E2F as a putative target of SCF action. Further analysis of genetic interactions implicated the SCFSlimb complex as a regulator of E2F function. Since genes encoding highly conserved activites often function across species boundaries, we attempted to evaluate mouse Cul1 (mCul1) function in Drosophila. To this end, we used a GAL4 transgene to drive overexpression of mCul1 in the wing disc. MS1096 is an X-linked transgene that expresses GAL4 strongly on the dorsal surface and more weakly on the ventral surface of the wing primordium in third instar larval wing imaginal discs. Because of dosage compensation, GAL4 levels in males (MS1096/Y) are twice those in heterozygous females (MS1096/+). In males (MS1096/Y;UAS-mCul1/+), mCul1 overexpression led to a strong reduction in the size of the wing without any gross patterning defects (fig. 1A,1B). Females (MS1096/+;UAS-mCul1/+) displayed a weaker phenotype that was sometimes indistinguishable from wild-type (see fig. 2A). In males, further increasing expression by using two copies of the UAS-mCul1 transgene reduces the wing to a rudimentary stump (not shown). The reduced wings also occasionally showed a multiple wing hair phenotype in which several trichomes instead of just one were produced by individual intervein cells, particularly in the region near the anterior cross-vein. Introduction of a single mutant copy of the Cul1k 01207allele  or a deficiency that uncovers Cul1 (Df(2R)NCX8) dominantly enhanced the wing reduction (fig. 1C). In contrast, decreasing the level of endogenous Cul3/guftagu (another Cullin family member, see http://flybase.bio.indiana.edu/) or expressing a GFP marker had no effect. Coexpression of Drosophila Cul1 (dCul1) suppressed the phenotype induced by expression of mCul1 (fig. 1D). These data show that overexpression of mouse Cul1 has a dominant negative effect on Cul1 function, or that dCul1 suppresses a neomorphic activity of mCul1. Dominant negative effect of mCul1 overexpression in the wing. (A) Wild-type wing expressing only the GAL4 driver (MS1096/Y). (B) Wings overexpressing mCul1 using the MS1096 GAL4 driver (MS1096/Y;UAS-mCul1/+) are smaller than wild-type. (C) When endogenous levels of Cul1 are reduced by introduction of a mutant allele of Cul1 (MS1096/Y;Cul1k 01207/+;UAS-mCul1/+), wing reduction is enhanced. 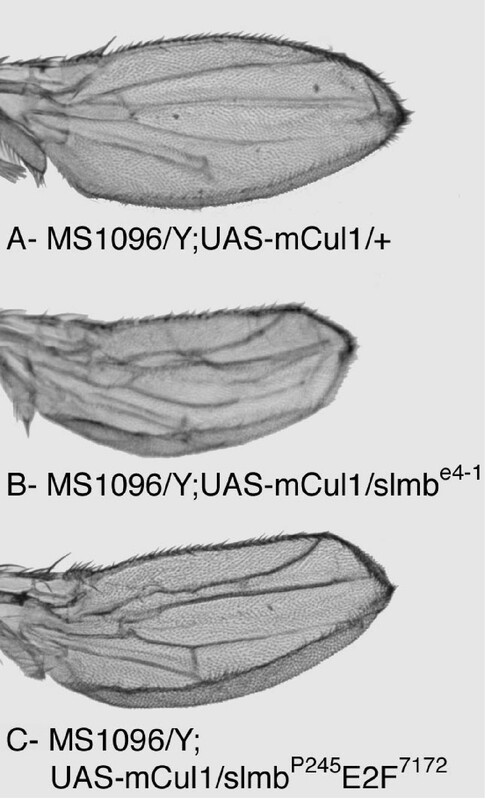 (D) Co-expression of fly Cul1 (MS1096/Y;UAS-mCul1/UAS-dCul1) rescues wing size to a phenotype indistinguishable from fly Cul1 overexpression alone (not shown). All wings in this and subsequent figures are at the same magnification. Scale bar is 1 mm. mCul1 overexpression leads to a reduction in SCF function. (A) Moderate overexpression of mCul1 (MS1096/+;UAS-mCul1/+) gives a weak phenotype that sometimes overlaps wild-type. (B) The presence of a deficiency that removes one copy of both dSkpA and dRoc1 (MS1096/T(1;Y)B106;UAS-mCul1/+) strongly enhances the reduction in wing size. (C) Wing with a strong phenotype (MS1096/Y;UAS-mCul1/+). (D) Co-expression of dSkpA (MS1096/Y;UAS-mCul1/UAS-dSkpA) partially restores wing size. (E) Reducing proteasome function by introduction of a dominant negative allele of a proteasome subunit (MS1096/Y;UAS-mCul1/DTS7) enhances the phenotype. (F) Full length Ci level in MS1096 wing disc. (G) Increased level of full length Ci in MS1096/Y;UAS-mCul1/+ wing disc. In F and G, Ci is detected by immunofluorescence. The outline of the posterior part of the disc (that does not express Ci) is shown by the dashed line. The solid line indicates the wing pouch region where GAL4 expression is strongest. To test if overexpression of mCul1 is sensitive to the dosage of other SCF components, we asked whether changing the copy number of both dRoc1 and dSkpA can modify the mCul1-induced phenotype. dRoc1 and dSkpA are located at the tip of the X chromosome in region 1B (Flybase, http://flybase.bio.indiana.edu/). The small wing phenotype seen in flies overexpressing mCul1 was enhanced when flies also had a deficiency uncovering this region (fig. 2A,2B), while coexpression of dSkpA rescued the wing phenotypes (fig. 2C,2D). These results show that SCF function limits the mCul1 overexpression phenotype. Cul1 and SCF function are required for proteasome-dependent degradation of a number of proteins in other organisms. We thus tested whether reduction in proteasome function would modify the phenotype caused by mCul1 overexpression. The DTS5 and DTS7 alleles are mutations in the β6 and β2 subunits of the proteasome . Both mutations, which have antimorphic activity, acted dominantly to strongly enhance the small wing phenotype generated by mCul1 overexpression (fig. 2E) supporting the idea that the phenotype is due to reduced degradation of an SCF substrate. To directly assess Cul1 function, we sought a target protein whose destruction might be limited by the activity of the Cul1/proteasome pathway. While SCF triggers ubiquitination and proteasome action degrades many substrates to completion, a few targets are instead cleaved and partially degraded. This is true of the transcription factor Cubitus interruptus (Ci): it is cleaved and its C-terminal portion is degraded . Cleavage and degradation require phosphorylation, SCFSlmb, and proteasomal activity. While complete inactivation of SCFSlmb causes cell death, it was shown that a cell-viable hypomorphic slimb allele resulted in accumulation of unprocessed Ci. Based on this, and findings that Ci accumulation is especially sensitive to pharmacological inhibition of the proteasome (data not shown), it appears that Ci levels are particularly sensitive to partial reduction in the activity of the SCF/proteasome pathway of protein processing/degradation. Inhibition of Ci processing can be scored by the accumulation of a C-terminal epitope . This assay showed that reduction in the function of Slimb or Roc1, two activities that contribute to SCF function, is associated with an increase in Ci staining . Similarly, reduction of Cul1 function by mutation in Cul1 (data not shown and ) or by overexpressing mCul1 (fig. 2F and 2G) led to Ci accumulation. Together these results indicate that mCul1 overexpression leads to a Cul1 dominant negative action that reduces SCF function. Based on the strength of the phenotype and its enhancement by removal of an endogenous copy of Cul1, we infer that the mCul1 expression only partially suppresses Cul1 function to create a hypomorphic phenotype. We infer that the wing defect results from a reduction in the rate of degradation of one or more targets of SCF action. The reduction in wing size in mCul1 overexpressing flies could result from changes in cell size or cell number. Each cell of the wing blade produces a hair and hair density indicates cell density and hence cell size. Wing hair density was unchanged by mCul1 expression, even when there was a dramatic effect on wing size (62.6 ± 3.0 cells/7950 μm2 for MS1096/Y; 60.8 ± 2.3 cells/7950 μm2 for MS1096/Y;UAS-mCul1/+). This result suggests that mCul1 overexpression causes a reduction in cell number either by a coordinate reduction in cell growth and proliferation or by increasing cell death. To distinguish between these possibilities, we dissected wing imaginal discs from late third instar larvae and stained them for mitotic or apoptotic cells. Labelling with an anti-phospho-histone 3 antibody did not reveal any significant changes in the number of mitotic cells (not shown). However, acridine orange staining showed a large increase in cell death throughout the wing pouch when mCul1 was overexpressed (fig. 3A,3B). Coexpression of baculovirus anti-apoptotic protein p35 rescued the reduction in wing size (fig. 3C,3D) indicating that mCul1 overexpression induces elevated apoptosis. 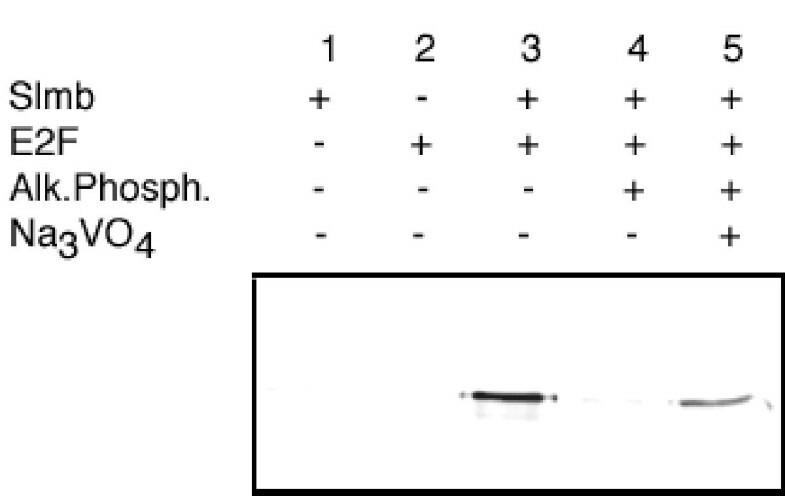 mCul1-induced apoptosis was insensitive to the coexpression of dominant negative forms of p53 (not shown). p35 expression also suppressed the multiple wing hair phenotype indicating that this phenotype too requires apoptosis. As dead cells do not contribute to adult structures, this phenotype must be a secondary consequence of cell death. We conclude that limiting SCF function induces apoptosis. Note that this conclusion does not argue against a cell cycle role for SCF, as defects in cell cycle progression can trigger apoptosis. Reduction in Cul1 function causes apoptosis. (A) Wild-type third instar wing discs stained with acridine orange show very little cell death. (B) Discs with reduced Cul1 function due to mCul1 overexpression have a high level of cell death. (C) Small wing phenotype due to mCul1 expression (MS1096/Y;UAS-mCul1/+). (D) Partial suppression when the anti-apoptotic protein p35 is co-expressed (MS1096/Y;UAS-mCul1/UAS-p35). Having determined that the mCul1 overexpression phenotype results from a dominant negative effect, we were in a position to test for genetic interactions between mCul1 overexpression and mutations in potential cell cycle targets of Cul1. Because SCF complexes have been implicated in cell cycle control in other organisms, we tested whether changing the dosage of cell cycle regulators dominantly modified the mCul1 overexpression phenotype. Reductions in the levels of a variety of cell cycle genes – cyclin E, dacapo, roughex, DP, RBF, string, cyclin A, rca1, wee1 and cdc2 – had no effect on wing size (not shown). In contrast, reducing the level of E2F by 50% completely restored wild-type wing size (fig. 4A,4B,4C), an effect that correlated with a strong reduction in cell death in the disc (fig. 4E,4F). The presence of a single hs-E2F transgene gave a weak and incompletely penetrant enhancement in the absence of heat shock, and this enhancement was stronger and completely penetrant when the transgenic strain was exposed to a heat shock treatment every 24 h during third instar and early pupal development (fig. 4D). Since the presence of the hs-E2F transgene and its induction by our heat shock protocol (low level overexpression compared to Asano et al., 1996) had no phenotype when in a wild-type background, we conclude that mCul1 expression sensitizes the cells to E2F overexpression. The reciprocal suppression by E2F mutation and enhancement by E2F overexpression show that the apoptosis triggered by mCul1 is mediated by or requires E2F function. Because a high level of ectopic expression of E2F is known to induce apoptosis , these results suggest that mCul1 overexpression might interfere with normal E2F downregulation. Dominant negative Cul1 interacts with E2F . (A) Wild-type wing. (B) Small wing due to dominant negative Cul1 expression (MS1096/Y;UAS-mCul1/+). (C) This phenotype is completely suppressed when E2F levels are reduced by 50% (MS1096/Y;UAS-mCul1/E2F91). (D) Increased levels of E2F from a transgene under the control of the HSP70 promoter enhance the small wing phenotype (MS1096/Y;UAS-mCul1/hs-E2F) after heat shock treatment. 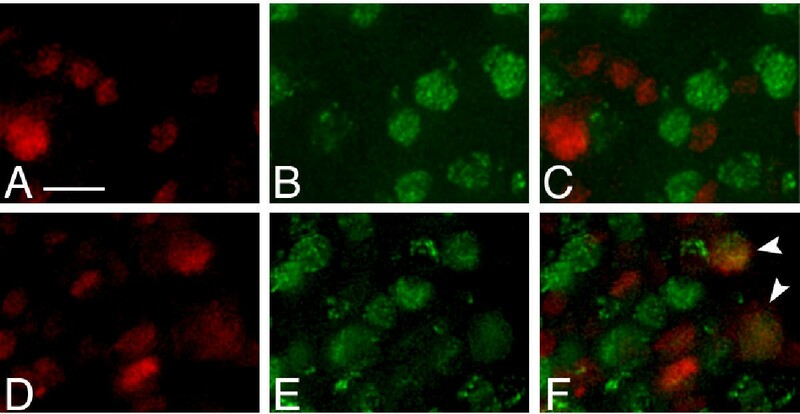 (E) Discs overexpressing mCul1 have a high level of cell death (MS1096/Y;UAS-mCul1/+). (F) Cell death is reduced when E2F levels are reduced (MS1096/Y;UAS-mCul1/E2F7172). Immunostaining for E2F in the furrow of the eye disc showed an abrupt drop in protein levels at the position where most cells exit G1 and initiate S phase . 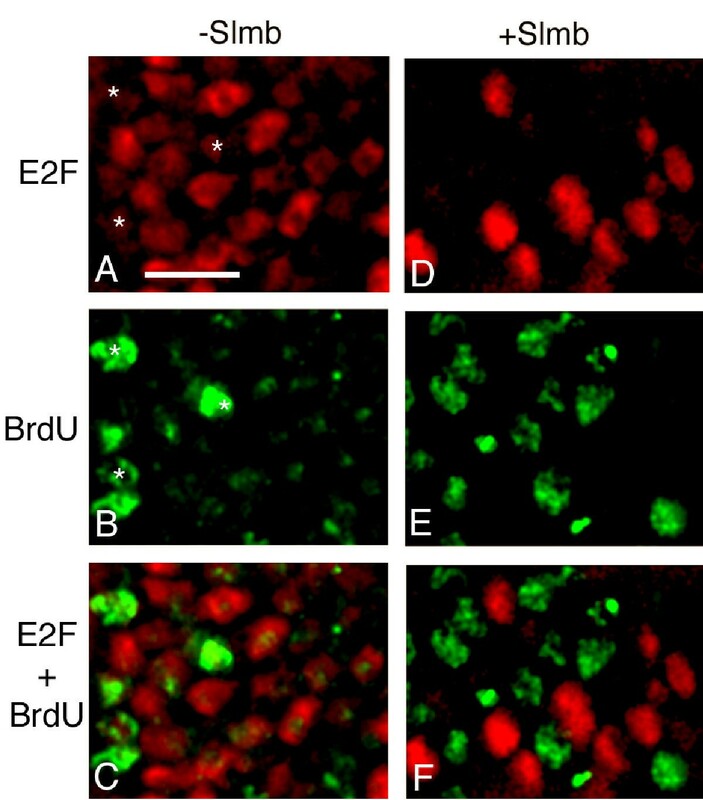 Using a double label approach, we were able to test directly for overlap between E2F presence and S phase as marked by 5-bromodeoxyuridine (BrdU) incorporation in dividing cells of the wing disc despite the asynchrony of division. No E2F staining was detected in BrdU labelled cells (green) of wild-type wing discs, whereas non-S phase cells showed strong E2F (red) staining (fig. 5A, 5B, 5C) (no E2F staining was observed in over a thousand BrdU positive cells from 8 different discs). Thus, E2F is downregulated in advance of significant BrdU incorporation in wild-type wing disc cells. Dominant negative Cul1 impairs E2F inactivation in S phase. Third instar discs were labelled for BrdU to detect S phase cells (green) and for E2F (red). (A-C) Wild-type wing disc. (D-F) mCul1-overexpressing wing disc. No overlap is seen in wild-type whereas there is overlap (arrowheads in F) in some cells that overexpress mCul1. Scale bar is 5 μm. When mCul1 is overexpressed, a small fraction of S phase cells (3% of 800 BrdU positive cells from 6 independent wing discs) contains detectable amounts of E2F (fig. 5D, 5E, 5F, arrowheads). Since E2F is normally degraded prior to S phase, the overlap in staining suggests that the partial suppression of Cul1 caused by mCul1 expression slowed E2F destruction to the point that it persisted briefly in S phase. We suggest, but have not demonstrated, that the low percentage of cells showing the overlap in the staining is due to a remaining capacity of the residual SCF activity to promote slower but still effective elimination of E2F during S phase. In any case, our finding shows that when dCul1 function is reduced, the normal pattern of E2F degradation in S phase is disrupted, leading to inappropriate persistence of E2F. While it could also be suggested that this effect might be secondary to other disruptions induced by dominant negative Cul1, the genetic suppression of phenotypes by reduction of E2F dose (above) suggests otherwise, as do the analyses of the role of the F-box protein, Slimb (below). The experiments described above demonstrate that overexpression of mCul1 produces a phenotype that can be modified by second site mutations and therefore could be used for a more general genome-wide modifier-screen. To determine whether other suppressors or enhancers might be isolated, we tested if deficiencies on the third chromosome uncover other potential interacting genes. One modifying deficiency, Df(3R)e-R1, removes region 93B6;D3-4 and acts as an enhancer of the small wing phenotype. One gene in this region, slimb, is an interesting candidate because this gene encodes an F-box protein that is part of an SCF complex . Several independent alleles of slimb were tested and all enhanced the dominant-negative mCul1 overexpression phenotype (fig. 6, compare A and B). Four deficiencies uncovering other predicted F-box containing genes (CG4911, CG3428, CG2010 and CG9003) or mutations in the F-box protein genes ppa and ago  had no effect on the phenotype (not shown) showing that the effect is specific. Interestingly, co-reduction of E2F and slimb function reversed the slimb enhanced mCul1 overexpression phenotype (fig. 6A and 6C) and loss of a copy of slimb attenuated the suppression of the mCul1 phenotype resulting from loss of one copy of E2F (compare fig. 4C and 6C). This mutual co-suppression suggests that slimb and E2F exert opposing activities on the same process and perhaps that Slimb acts on E2F or on a critical regulator of E2F activity. Interactions with slimb . (A) Control (MS1096/Y;UAS-mCul1/+). (B) slimb mutations are dominant enhancers (MS1096/Y;UAS-mCul1/slmbe 4-1). (C) A chromosome bearing mutations in both slimb and E2F has no effect on the phenotype (MS1096/Y;UAS-mCul1/slmbP 245E2F7172). We thus wished to test whether loss of Slimb had an effect on E2F protein in imaginal discs. As slimb null mutants die as first instar larvae, direct analysis of the mutant discs was not possible. The severity of the slimb mutant phenotype suggested that the mutation reduced crucial SCF functions much more than did expression of mCul1. We used a slimb mutant stock carrying a slimb transgene under the control of the HSP 70 promoter to modify the time of onset of the slimb mutant phenotype. In the absence of heat shock, slimb homozygotes exhibited the early lethality of slimb mutants, but a single 30 minute heat shock at 37°C during first instar was enough to allow some larvae to reach the wandering third instar stage 4 days later. These larvae have small imaginal discs. Labelling of these discs with the anti-E2F antibody revealed that nearly all cells expressed E2F (fig. 7A). Many of these cells also incorporated low levels of BrdU (fig. 7B and 7C), usually in regions of the nucleus with lower E2F staining. A few cells also had high levels of BrdU incorporation and these also expressed E2F, although at lower levels (asterisks on fig. 7A and 7B). An hour and a half after a heat shock that restored Slimb expression, BrdU-labelled cells no longer contained detectable levels of E2F (fig. 7D,7E,7F). No accumulation of E2F mRNA can be seen in slimb mutant discs (fig. 8) suggesting that any effect of Slimb on E2F occurs posttranscriptionnally. These results indicate that elimination of E2F during DNA replication requires Slimb. slimb mutant cells accumulate E2F in S phase. (A-C) slmb8, hs-slmb disc cells without heat shock, (D-F) slmb8, hs-slmb disc cells 1.5 hour after a heat shock restoring Slimb expression. E2F is in red, BrdU in green. C and F show merged images of A and B and D and E respectively. Asterisks point to cells with high BrdU incorporation that still express E2F. Scale bar is 5 μm. E2F mRNA does not accumulate in slimb mutant discs. (A) Wild type wing disc and (B) slmb8, hs-slmb wing disc hybridized with a digoxygenin labelled E2F probe and detected by an indirect fluorescent staining method . The disc from the slimb mutant is much reduced in size but in all cases examined, it showed an hybridization signal comparable to the wild-type disc. The above results raise the possibility that an SCFSlmb complex can target E2F for degradation. If this is the case, it is expected that Slimb would recruit E2F to the complex. To test this hypothesis, we asked whether Slimb and E2F physically interact. To this end, 35S-labelled E2F was produced in vitro in a wheat germ lysate and incubated with the WD repeat region of Slimb fused to GST and bound to beads. Analysis of bead associated proteins (fig. 9) showed association of radiolabeled E2F with the fusion containing the WD-repeat region of Slimb (lane 3) but not with GST (lane 2). The interaction between Slimb and E2F depends on a phosphorylation event as it is prevented by the presence of active alkaline phosphatase (lane 4) but not when the phosphatase is inhibited by sodium vanadate (lane 5). Similar results were obtained with E2F2, the other Drosophila E2F family member (not shown). Slimb and E2F associate in vitro. GST-Slimb(176–510) can interact with E2F (lane 3) but not with another protein (luciferase, lane 1). GST alone does not interact with E2F (lane 2). Treatment of E2F with active alkaline phosphatase prevents binding to Slimb (lane 4). Binding is restored in the presence of the phosphatase inhibitor Na3VO4 (lane 5). We have provided evidence indicating a role for an SCFSlmb complex in elimination of E2F during S phase in Drosophila. We first demonstrated that mouse Cul1 overexpression has a dominant negative effect on SCF function in the wing imaginal disc resulting in apoptotic cell death leading to a small wing phenotype in adult flies. Thus, SCF activity normally suppresses cell death. The cell death that occurred upon reduction of Cul1 function was suppressed when E2F function was reduced by mutation. This genetic interaction might be due to action of E2F and Cul1 in parallel pathways, one suppressing and one enhancing cell death, or they might act in opposite directions in the same pathway. Because SCF complexes are involved in controlling protein degradation, we favoured the hypothesis that Cul1 promotes the destruction of E2F and that the inappropriate persistence of E2F leads to cell death. Consistent with this idea, E2F overproduction can induce apoptosis . Furthermore, cell cycle specific destruction of E2F was suggested by the finding that E2F protein becomes undetectable in the synchronised S phase cells of the morphogenetic furrow of the eye imaginal disc . Our double labelling analysis extended this finding to the asynchronously cycling cells of the wing imaginal disc and demonstrated that E2F is rapidly degraded prior to significant DNA replication. In contrast, we found that E2F was detected in a fraction of S phase cells when SCF function was reduced by mCul1. This shows that normal E2F downregulation is delayed or slowed by reduction in SCF function. Although the dominant negative action of mCul1 in Drosophila was unanticipated, it offers a fortuitously convenient tool for the analysis of SCF function. The Drosophila Cul1 mutant is less useful because maternal contributions of Cul1 are so large that homozygous mutant animals develop to pupariation. Additionally, unlike the spatially restricted expression of mCul1, the strong Cul1 mutant alleles result in lethality. The stage and generality of the defects make analysis of the Cul1 mutant phenotype particularly difficult. In contrast, the induced expression of mCul1 in the wing disc does not compromise viability and it gives a distinctive graded phenotype well suited for the study of genetic modification. While the basis for the dominant negative effect of mCul1 remains unknown, it is important to recognize that inactivation of the endogenous Cul1 is incomplete so that a reduced level of Cul1 activity persists. One likely explanation for the negative effect is that mCul1 overexpression leads to sequestration of some limiting SCF components into weakly active complexes. This hypothesis is consistent with the fact that mCul1 retains some positive function in flies as revealed by its ability to prolong survival of dCul1 mutant flies (J.-K. Hériché and P.H. O'Farrell, unpublished data). The essentially complete suppression of the mCul1 phenotype by reduction of the genetic dose of E2F suggests a remarkable level of specificity, in which, among the many targets of Cul1 action, the destruction of E2F appears to be particularly important. Similarly, limitations of Cul1 function in other organisms also uncovered the disproportionate importance of particular substrates. For example, Cul1 mutations in mice result in the accumulation of the SCF substrate cyclin E but not of p27 another well characterized SCF substrate . Among all of the substrates targeted for degradation by SCF in S. cerevisiae, it is the failure to degrade Sic1 that underlies the G1 arrest in cdc53 mutants . Thus, different substrates of the SCF appear to have particularly high dependence on SCF activity in different biological contexts. We suggest that our experimental context using mCul1 expression in the wing disc is particularly effective in exposing the involvement of SCF in E2F destruction. Since SCF complexes function in conjunction with a variety of F-box proteins that act as specificity factors, mutations in individual F-box proteins ought to affect particular subsets of SCF substrates. In an extensive screen for loci that modify the reduction of function phenotype for Cul1, we identified the gene encoding the F-box protein Slimb as a modifier, and we failed to detect contributions of other F-box encoding genes to the phenotype. This implicates Slimb in the action of SCF on E2F. Analysis of E2F levels revealed that cell cycle oscillations in E2F levels were absent when Slimb function was severely reduced. Note that the severity of this E2F destruction phenotype in comparison to the mild defect in cell cycle programming of E2F destruction upon mCul1 expression is entirely consistent with the fact that the slimb mutant gives a stronger loss of function than the reduction of function imposed by mCul1 overexpression. The absence of cell cycle oscillation in E2F presence in the slimb mutant suggests that SCFSlmb is responsible for targeting E2F for S phase destruction. If this destruction is the consequence of direct action of SCFSlmb on E2F, we would expect the F-box protein to interact with E2F. We confirmed this prediction by pull-down experiments. Furthermore, we demonstrated that the interaction between Slimb and E2F is dependent on phosphorylation, as expected for the interaction of F-box proteins with their substrates. We suggest that the S phase specificity of E2F destruction is regulated by a targeting phosphorylation event, but we have not yet investigated this level of the regulation. While SCF was previously implicated in the destruction of E2F-1 in mammals , this earlier study appears to focus on a distinct action of SCF. The starting point for the analysis was an interaction between E2F-1 and Skp2, an F-box protein that is not the mammalian homolog of Slimb. Mutations of E2F-1 that disrupted this interaction increased E2F-1 stability in transfection experiments. However, there was no demonstration that this interaction was involved in or required for cell cycle oscillations in the level of E2F-1. Furthermore, Skp2 knockout cells show no defect in E2F-1 degradation , and E2F-1 proteins unable to interact with Skp2 are still unstable . Our results implicate SCFSlmb rather than SCFSkp2 in cell cycle specific destruction of E2F and argue that this regulation is critical for cell viability at least in flies. As a unifying view, we propose that Skp2-mediated control and Slimb-mediated control of E2F activities occur at different times during the cell cycle and that SCFSlmb is responsible for the rapid destruction of E2F in S phase. Since E2F is a positive regulator of the G1/S transition, it is not clear why S phase destruction of E2F is required. However, we note that slimb mutant cells do not replicate DNA normally and the replication defect is correlated with an increase in E2F in individual cells. This observation is consistent with previous reports indicating that E2F can limit DNA replication both in mammalian cells  and in flies . This enigmatic feature of E2F regulation suggests that its continued presence has a negative effect on DNA replication and indicates that we still have much to learn about its roles in cell cycle regulation. SCFSlmb appears to influence other cell cycle events, perhaps by actions on other substrates, or perhaps as a result of events that are secondary to its influence on E2F destruction. For example, a slimb allele shows defects in centrosome duplication control , and slimb null cells undergo apoptosis . Both effects could be explained by a failure to inactivate E2F, as E2F promotes centrosome duplication in mammalian cells  and E2F can induce apoptosis . A link between Slimb function and the RB/E2F pathway of cell proliferation control is also suggested by the genetic interaction between the C. elegans slimb ortholog lin-23 and the RBF ortholog lin-35 in which lin-35 function limits the severity of the loss of lin-23 . Since RBF is an important modifier of E2F activity, perhaps this interaction is a reflection of the action of both Lin-23 and Lin-35 on E2F. However, in our experimental situation, we did not observe any modification of the mCul1 overexpression phenotype by mutations in either the RBF or DP gene, two known partners of E2F. This result suggests that these factors are not limiting factors in this situation or that E2F acts independently of RBF and DP. The latter hypothesis is the most likely explanation for the lack of an RBF interaction for the following reason. The E2F/RBF complex has to be disrupted for E2F to drive cells into S phase and E2F degradation occurs after the G1/S phase transition which only happens after E2F has been released from its association with RBF. According to this view, we would predict that the mCul1-induced phenotype should be specifically sensitive to factors impinging on the elimination of E2F activity during S phase, and factors involved in the unknown processes by which persistence of E2F has negative outcome. Consequently, this experimental system may provide an avenue for the genetic dissection of this mysterious facet of E2F function. To explore potential roles for Cul1 in cell cycle control in D. melanogaster, we overexpressed mouse Cul1 (mCul1) in the wing imaginal disc. We found that this overexpression has a dominant negative effect leading to a reduction in SCF function. We used the resulting small wing phenotype in a modifier screen to identify mutations in cell cycle genes capable of dominantly modifying the mCul1-induced phenotype. We found that E2F loss-of-function mutations were the strongest modifiers as they completely suppressed the phenotype. The reduction in SCF function associated with mCul1 overexpression also correlated with a failure to downregulate E2F normally in S phase. Additionally, mutations in slimb that reduced the function of the F-box protein Slimb enhanced the phenotype and led to persistence of E2F in S phase cells. Finally, this F-box protein interacts with E2F in vitro. These results indicate that an SCFSlmb complex is involved in regulating E2F activity during S phase. We identified several lead ESTs in the Berkeley Drosophila Genome Project database. Sequencing of one of the corresponding cDNAs (LD20253, obtained from Genome Systems Inc., St. Louis, MO) revealed that it encodes a protein with 61% identity to the mouse and human Cul1 proteins. Expression of this cDNA in yeast is able to rescue the cdc53-1 mutation (not shown) indicating that the protein can perform at least some of the functions of the yeast Cul1. We used the same strategy to identify a Skp1 cDNA that also rescues skp1 mutations in yeast (not shown). Because the Drosophila genome contains several Skp1-like genes, we call the fly Skp1 homologue dSkpA. UAS-mCul1, UAS-dCul1 and UAS-dSkpA were generated by subcloning the coding region of the corresponding cDNA in pUAST . The resulting vectors were then used to transform y1w67 embryos. The MS1096 stock is as described . The Cul1 allele k01207  will be described elsewhere. The following mutations were tested for genetic interaction with mCul1 overexpression: E2Frm 729, E2F91, E2F7172, cycAC 8LR 1(a gift from Christian Lehner), cycAneo 114, cycEAR 95, stg7B, stgAR 2, cdc2B 7, cdc2E 1–9, DPvr 10–13, Df(2R)vg56, Dwee1ES 1(a gift from Shelagh Campbell), Df(2L)WO5, gft1, gft6430 (gifts from Hemlata Mistry), rca103300, rca12, dap3X 1, DTS5 and DTS7 (gifts from John Belote). The Bloomington Stock Center (Bloomington, IN; http://flystocks.bio.indiana.edu/) provided the l(2)k01207 and T(1;Y)B106 stocks and the deficiency kit for the third chromosome. The Umeå Stock Center (Umeå, Sweden) provided the Df(2R)NCX8 stock. UAS-p35 and UAS-PI3KD954A were given by Bruce Edgar and Michael Waterfield, respectively. Slimb alleles were provided by Tian Xu (slmbe 4-1) and Bernadette Limbourg-Bouchon (slmbP 245, slmb8 and slmb8, hs-slmb). For modification of the mCul1 overexpression phenotype, MS1096; UAS-mCul1/TM3,Sb virgin females were crossed to males bearing the tested mutation or transgene over a marked chromosome (L or If for the second chromosome, TM3,Sb or TM6B for the third chromosome) and males from the progeny were inspected for modification of the phenotype. All crosses were kept at 25°C. The wings of all MS1096; UAS-mCul1/+ flies reach the tip of the abdomen and all modifiers are highly penetrant. A mutation was considered an enhancer if the wings were significantly shorter and a suppressor if they were clearly longer. Mutations on the X chromosome were first recombined with MS1096 and interactions were tested in females by crossing MS1096/Y;UAS-mCul1/TM3 males to virgin females carrying the mutation and MS1096 over a balancer. As a control, MS1096;UAS-PI3KD954A/TM3 virgin females were crossed to males bearing modifiers of the mCul1 phenotype. Modifiers that had the same effect on both the mCul1 and the dominant negative PI3K phenotypes were discarded as they presumably affected the GAL4 driver. Wings were dissected and mounted in glycerol/ethanol (1:1) and pictures were taken under brightfield illumination on a Leica microscope equipped with a CCD camera. Heat shock treatments consisted of two 10 minutes incubations at 37°C separated by a 20 minutes interval at 23°C. Cell size was assessed by counting trichomes in a 7950 μm2 area on wings from 10 different flies. For acridine orange staining, discs were dissected in Schneider's medium, incubated for 5 minutes in medium containing 1.6 × 10-7 M acridine orange, washed briefly and put on a slide in a drop of medium. Pictures were taken immediately. For E2F/BrdU double staining, discs were first incubated 30 minutes in a drop of Schneider's medium containing 10% fetal calf serum and 1 mg/ml BrdU then fixed 20 minutes with 2% formaldehyde in PLP (10 mM NaIO4, 75 mM Lysine, 37 mM NaH2PO4, pH 7.2). Fixed discs were then permeabilized in PBS containing 0.1% saponin and 1% goat serum and incubated overnight with an anti-E2F serum  at 1/250. Two rounds of amplification (reaction time: 10 minutes) with the tyramide biotin system (NEN) were used to detect E2F. Following this, the discs were processed for BrdU detection as previously described . Images were taken with a Princeton Instruments CCD camera on an Olympus inverted microscope using the DeltaVision microscopy system software. Cubitus interruptus was detected using the rat monoclonal antibody 2A1 . To compare protein levels, control and mCul1-expressing discs were processed together. E2F mRNA was detected by in situ hybridisation using an antisense probe as described . A sense probe used as control gave no signal. To compare levels, discs were processed together. Plasmid pGEX4T1-Slmb(176–510) allowing expression of fragment 176–510 of the Slimb protein fused to GST was kindly provided by Anne Plessis and Matthieu Sanial. GST fusion proteins were purified from Escherichia coli BL21 as described , except that bacteria were grown at 30°C. In vitro translated (IVT) proteins were produced and radiolabelled with 35S-methionine using the TNT coupled wheat germ extract system from Promega. IVT proteins were incubated with the GST fusion proteins on beads for 1 hour at 4°C in 500 μL of 40 mM HEPES pH 7.4, 100 mM KCl, 5 mM MgCl2, 1 mM EDTA, 1% Triton X100, 1 mM ATP, 1 μM microcystin, 14 mM b-mercaptoethanol. For phosphatase treatment, IVT proteins were first incubated in 130 μl of binding buffer containing 20 U of alkaline phosphatase in the presence or absence of 10 mM Na3VO4 for 1 h at 37°C. After incubation, beads were then washed three times with incubation buffer containing 130 mM KCl. Bound proteins were then analysed by SDS-PAGE and autoradiography. We thank Maki Asano for the generous gift of anti-E2F serum, Matthieu Sanial and Anne Plessis for making the GST-Slimb construct available and Christelle Fiore, Edan Foley and Renny Feldman for critically reading the manuscript. This research was supported by an NIH grant to P. H. O'F. This work was initiated while J.-K. H. was the recipient of a fellowship from the Association Française pour la Recherche Thérapeutique. JKH conceived and carried out the experiments under the supervision of POF. DA constructed the mCul1 expressing lines and made the initial phenotypic observations under the supervision of EB. All authors read and approved the final manuscript.